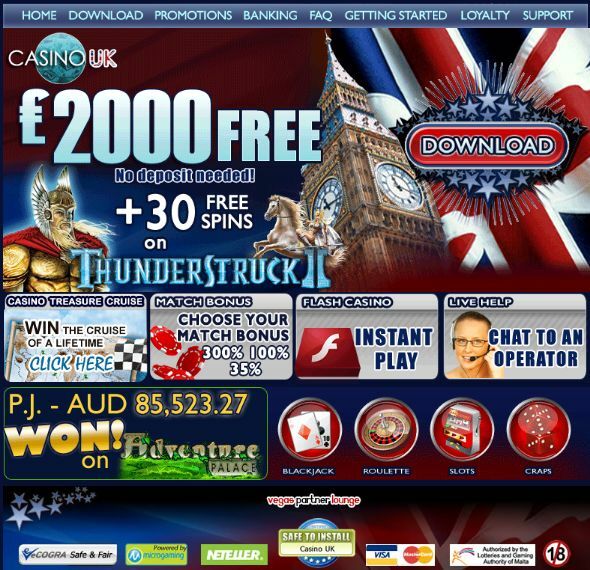 Casino UK is a fun online casino where you can find great gaming and service in true English style. Since 2002 Casino UK has brought the class and sophistication of the British culture to the world of online gaming and you too could experience the royal treatment when you join. Casino UK is powered by the online casino software provider, Microgaming™. The software is available in a downloadable version and also for instant play in the online Flash version. Players can choose to play for fun or for real money. They offer more than 600 online casino games for you to choose from including table games, card games, slots games, video poker and progressive games. New players at Casino UK are eligible for $/€/£2,000 free to play with for 60 minutes! No need to make a deposit, meaning no risk to you and you will be also be given a chance to keep your winnings afterwards. You can also opt for the special Match Bonus offer when making your first deposit. You can choose from one of three bonuses! There is a 300% Match Bonus for buy-ins of up to $/€/£29; a 100% Match Bonus on deposits of up to $/€/£284 or a 35% Match Bonus on amounts up to £350. You choose how much you’d like to deposit and therefore choose how much free credits you receive in return. 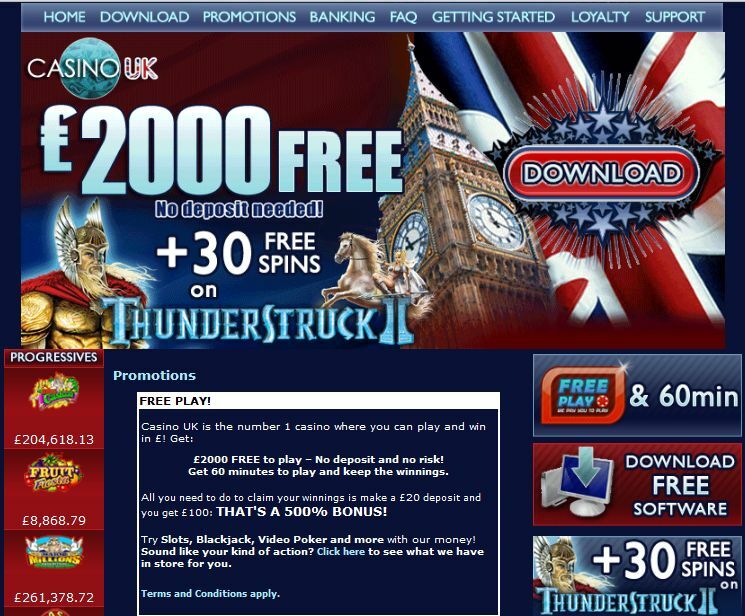 Along with the Match Bonus offer you will also receive 30 Free Spins on the popular video slot, ThunderStruck 2, following your first deposit. As a member of Casino UK you also qualify for the 4-tier Vegas Partner Lounge’s loyalty program. You can earn casino credits plus be eligible for exclusive bonuses and promotions as part of the loyalty program. If you have any queries when playing at Casino UK, you can contact their customer service support which is available 24 hours a day, seven days a week. They can be contacted via email, telephone of instant live chat. Customer support is available in multiple languages including English, German, French, Swedish, Greek, Nordic, Danish, Chinese, Russian, Italian, Dutch, Spanish, Japanese and Portuguese. Players can make deposits into their Casino UK account via a number of safe and convenient options and in one of several international currencies. These include VISA, Master Card, Maestro, Solo, Switch, Ukash, GiroPay, ClickandBuy, Click2Pay, WebMoney, UseMyWallet, UseMyBank, Paysafe Card, Eco Card, wire transfer, bank transfer, EntroPay, Moneybookers, NETeller, InstaDebit, POLi, iDEAL, EPS and more. All transactions are safeguarded and you can rest assured all your information is kept confidential. Casino UK is part of the Vegas Partner Lounge Group. It is licensed by the Kahnawake Gaming Commission and the Lotteries and Gaming Authority of Malta. They are also certified by eCOGRA to ensure safe and fair gaming.